Who’s having big fun this summer? All of you, I hope, but most of all I’m quite sure the Scottish Coastal Rowing Association folks are having a riot! I’ve been meaning to write another post about the SCRA for a little while, but have been distracted by all sorts of busy-ness – with the result that a lot of people have beaten me to it. 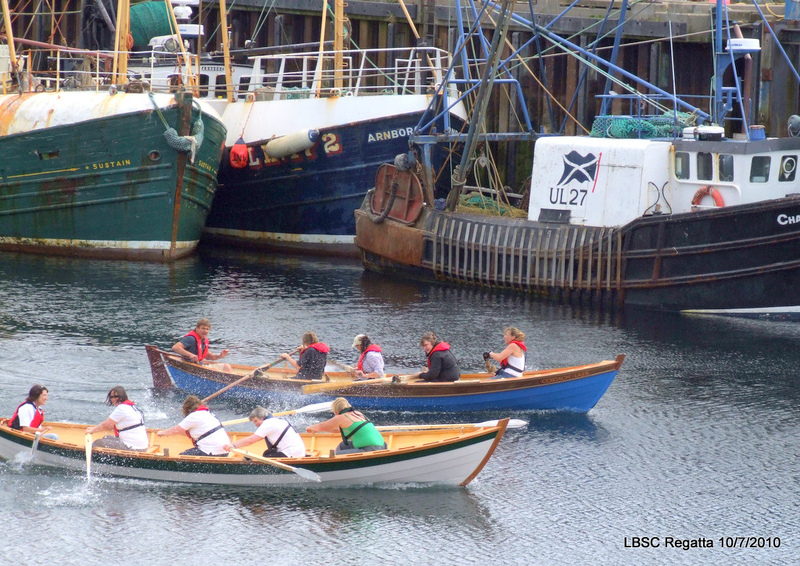 So this is just a short post designed to serve as a reminder that this project to create a new class of rowing racing around the coast of Scotland is proving amazingly successful with races taking place at Portsoy and at Eyemouth. PS – I’d also like to draw readers’ attention to Osbert Lancaster’s thoughtful and informative comment below. It’s well worth a look. Thanks Osbert! Thanks for highlighting the SCRA – it certainly IS lots of fun. I'm part of the Portobello crowd. We're holding the first regatta in 40 years next weekend – we should have details on the website rowporty.org.uk soon. While racing is definitely a key part of the coastal rowing thing, it's not an obsession – nor taken too seriously (yet, and I hope it never will be!). At races crews are often made up by who's on the spot at the time – at Eyemouth I missed out on one race because I went to get an icecream, and Portobello people rowed for two other teams because they were short handed! Certainly in Portobello we also like to use our skiff – Icebreaker – for fun as well as competition. We are planning a trip to a nearby island for a picnic – weather permitting which currently looks unlikely for a while – and some people like to go fishing! And don't be put off by the Scottish in the title – any community can build a boat and join in! Incidentally, we've been gifted two traditional clinker rowing shells for single oarsman. At least I think so, I've not seen them yet! Long thin things with sliding seats and outriggers and they're said to date from the 1930s – they've been stored in a shed by two old rowers after the previous rowing club closed in the 80s. We hope to have them on the sea again soon – but only when it's very calm. PS Could you change the link for 'The Firth of Forth by Sail and Oar' in your blog role? I've moved in from WordPress to: http://forthsailoar.posterous.com Ta! Thanks Osbert. I've changed the link. Don't forget me, Gav! Sure wish I could pull the oar of a St. Ayles Skiff. Might have to build one myself – probably wouldn't cost much more than a trip to Scotland!